The bottle: “This is a proper, old-fashioned English beer for adults – not one of those craft beers the kids drink these days with flamboyant names and even more colourful labels.” That’s what the Proper Job beer label seems to scream out to me. Unsurprisingly, there’s even a Campaign for Real Ale (CAMRA) logo on the back of the bottle (the advocacy group that, among other things, promotes beers in the UK that have been made the “traditional” way). But overall it’s not a bad looking bottle of beer and I look forward to tasting it. Blurb on the bottle: A ‘proper’ India Pale Ale, Proper Job is a strong golden ale that’s powerfully hopped. Brewed using natural Cornish spring water and Maris Otter barley blended with three carefully selected varieties of hops, it’s bursting with citrus and grapefruit flavours. Naturally conditioned in the bottle to ensure maximum flavour. St Austell Brewery: The brewery was founded in 1851 in St Austell, Cornwall. Since then, it’s produced a whopping 676,943,096 pints (and counting), according to its website. St Austell’s products include Tribute Ale (which I’ve imbibed many a time while living in the UK), Tinner’s Ale, and Duchy Bitter. Tastes like: A warm English pub with my mates, talking nonsense and watching the footy on the television. But I wasn’t drinking this beer at the pub in England – I was at my house in Auckland, New Zealand. So it’s probably fair to say that this 500ml bottle of Proper Job probably isn’t the freshest specimen. That might go some way to explaining the significant amount of head when I poured it into a glass; at one stage there was nearly twice as much foam in my glass as there was beer. While I waited for the head to die down a little bit, I got to enjoy Proper Job’s wonderful aroma of tangy fruits and sweet malt. Colour wise, the Proper Job pours pale amber. It’s certainly a premium-tasting IPA with a medium mouth-feel. You can really taste the hops, and yet, somehow, it’s fairly well balanced at the same time. It’s very different to the much edgier craft IPAs I’ve been drinking in New Zealand (and even on a recent trip to America), which often pack a similar hop punch but don’t quite have the balance that this beer does. Meanwhile, the IPAs I’ve become familiar with here in New Zealand tend to have a fruitier character than the Proper Job IPA (I can’t taste the grapefruit mentioned in the blurb on the bottle). That’s not a criticism either way, just an observation. Is it the best beer ever? Well, no, probably not, but it’s still a very good IPA. I’d definitely recommend it. However – and this would make a good subject for an opinion piece one day – I reckon all this talk about “proper” IPAs and “real” ales gets a little bit old. Personally, I don’t really care how a beer is made – so long as it tastes good. 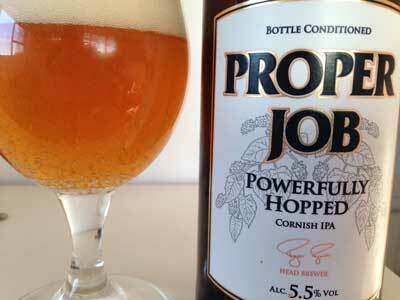 St Austell Brewery’s Proper Job IPA certainly ticks that box. Hmm I found this to be a very light bodied ale, not at all what I’m used to in terms of a decent malt base and a good IPA. Not sure how reviewers could call it medium bodied. Quite pleasant however, definitely drinkable, and definitely some lovely fruity light floral (elderflower?) tastes and aromas. I’d like to find a clone recipe and give it a go myself as I feel it’s got real potential. Just not there for me as it is.